Erect-A-Rack presents the Brownbuilt Commercial Shelving, designed to suit all types of offices with restricted space and enhance modern office designs. This new commercial shelving system has been developed to compliment modern efficient records management and storage systems by combining the strength and durability of Light Duty RUT shelving with aesthetics and versatility. 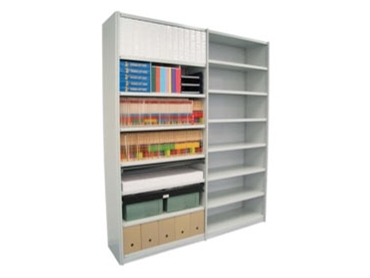 Metal cover panels ensure a clean, attractive finish to the ends of shelving stacks.